The initial set of potential place names included 12,022 words; the first step of our annotating team was to decide whether a word actually is a place name. The world is a complicated place, and we could not always make a simple binary decision (“yes, this one is a place name” — “no, that one isn’t”). We have prepared a five-degree scale, where estlocus0 meant “not a place name”, estlocus1 meant “yes, it is a place name”, and other values marked different interpretative issues. It turned out that some place names are multi-word expressions, still others are rhetorical references (metonymies or other figurative usages of words to signify precisely defined places), while a large group consists of complicated situations. This initial triage enabled us to concentrate in the first round of annotation on unequivocal and multi-word place references. But the triage also had brought us a valuable set of “hard” place name usages, to which we can turn when we will be looking for challenges to our model. Place names have been annotated grammatically – we have identified their lemmata and their morphological features – and now we are working on identifying places denoted by the words: post verba, res. In preparing annotations, it turned out to be extremely important to think precisely and clearly (qui bene distinguit…); for example, clarifying the aims through discussion has led us to better see the purpose and function of our lemmatization phase – there are may be multiple meanings of the same string of letters, but in this phase of our project we are not annotating meanings, we are simply connecting a word to its canonical form. Our annotation system is a database — an XML database built using XQuery and BaseX, to be more precise — in which each set of annotations (lexical, morphological, identifying places, periods, rhetorical status) is a table. What connects the tables are unique identifiers for annotations — they, or their parts, serve as primary keys of our records. This means that, in parallel with annotating places, we have been busy modelling a database which will bring together various types of annotations. As the annotations will be revised, it was vital to define tests and validation rules for each table. Eventually, we hope to automate fully the processes of testing and rebuilding the database, so that we can easily add new annotations or revise existing ones. While in the beginning the annotators were working in Google Spreadsheets (and their primary work still happens there), as the job goes on, we are beginning to move our discussions and collaboration to our Github repository. I am happy to report that the team is constantly improving their Github skills! Our database and our project would not be possible without the ability to point precisely towards a specific word in a specific edition of our texts. For that, the concept of CTS / CITE Architecture, developed by Neel Smith and Christopher Blackwell, has been indispensable. 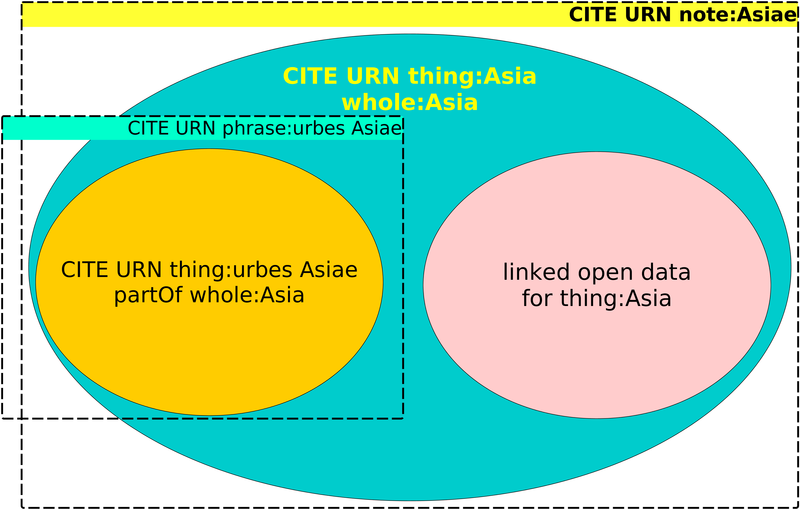 Our texts exist in special XML editions tokenized to the level of sentences (or verse lines) and words; each segment of these editions has been assigned a CTS URN; towards these URNs point all our annotations (which themselves have CITE URN identificators). One (famous) definition of philology sees it as Erkentniss des Erkannten, “knowledge of what is known”. The essence of our philological work in the CroALa index locorum may be defined as a variation of it, as linking what has to be linked. We are establishing links not only inside our system — from the text segments towards their annotations — but we are also reaching out, trying to connect our annotations to other people’s linked data. We are not doing this because we are lazy (though I, personally, have nothing against that), or because we are trendy (though…). In my opinion, scholarship rests on consensus; if I can get people to agree with my thesis, that thesis is worth something — but, also, if people have already agreed on something and have published the result of their agreement, we want to build further on that. Sources of data the CroALa index locorum is linking to are: for linguistic data, the Perseus Lexical Inventory and their morphology tagset; for place identification, the Pleiades and Wikidata — we expect lots of fun with the imaginary places and with temporally bound spatial entities such as the Kingdom of Hungary; for periods, we will start from PeriodO — though we will probably end up composing and publishing our own period identification set for the mythical time, and probably one for Croatian history as well.